Cet appartement de 2 chambres entièrement rénové, bien équipé, dans un immeuble classé de catégorie II, propose un hébergement de première classe pour les familles et les couples et se trouve près de West Cliff. Il est bien situé à quelques minutes à pied du centre-ville de Whitby, du port et de toutes les commodités. Les 2 baies vitrées attrayantes de l'appartement donnent sur la rue Skinner, datant de l'époque victorienne, avec ses antiquaires, ses cafés, sa boulangerie traditionnelle et ses choix de maisons publiques. L'un des magasins populaires de poissons et de pépites de Whitby se trouve juste au coin de Silver St.
Salle de bain a une baignoire avec douche à commande thermostatique. Fabulous, central, well equiped property! Three generations of our family came to show the grandchildren a typical English seaside holiday and were not disappointed. The property is central so we had a short walk to the beach or into town. The parking was easy to sort, the car was parked in the next street and we didn't need it. 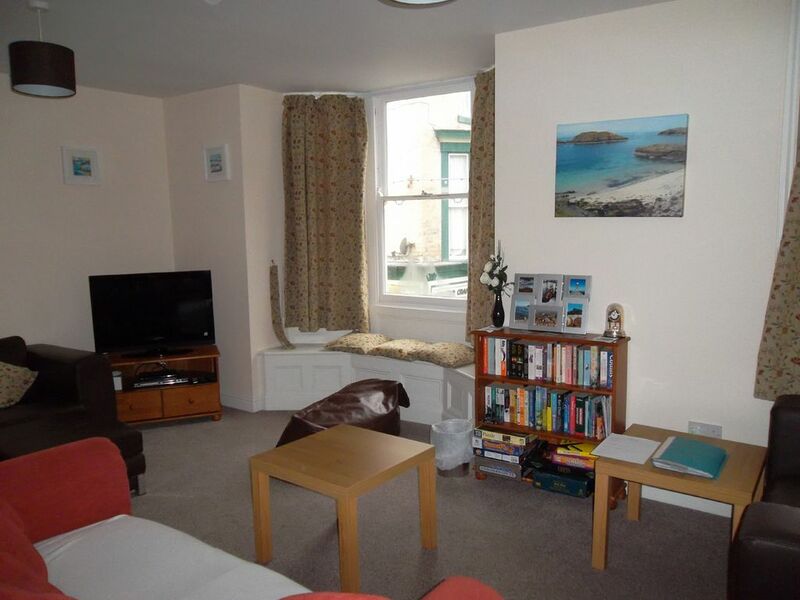 The property is a good size and the novelty of a bay window to watch the world go by was entertainment itself! It had everything we needed and more. We even completed the 636piece Whitby jigsaw. The owners were at the end of the phone for any queries we had. The grandchildren at 6 and 4 years old loved everything Whitby had to offer and it was a nostalgia trip for their Mum who last visited Whitby over 30 years ago! Four friends stayed at the apartment which was clean, spacious and in a great location in Whitby. It had everything we needed. The information and communication between us and the owners was excellent. Brilliant location 10 min walk to the west cliff 15min walk to town there are even a few short cut alley ways if you like stairs to the iron bridge. The apartment was lovely and clean so much more bigger than we were expecting and really good value for money everything we needed was there cooker Hoover washing machine we will most definitely be staying there again it's beautiful. We have thoroughly enjoyed our stay in this lovely apartment which has everything you need for a break away. The apartment is in a perfect location for walking to the Whale Bone Arch, The Harbour, The Abbey and there are numerous shops, cafes and restaurants close by. Although it is in walking distance of the main attractions it was lovely and quiet. Would highly recommend this Apartment. We had fantastic weather too! Thank you Phil & Jan for letting us stay! Great location, very spacious apartment. Booking Notes: Ring the owner to check availability. Deposit and booking form to be returned within 3 days to confirm booking. Balance due 8 weeks before arrival. Changeover Day: Fridays preferred in summer but we can be flexible. Notes on prices: Short breaks of 3 days or more are available. Prices on request.